If you want to cultivate a happy workforce, you may want to try looking toward the construction industry for inspiration. 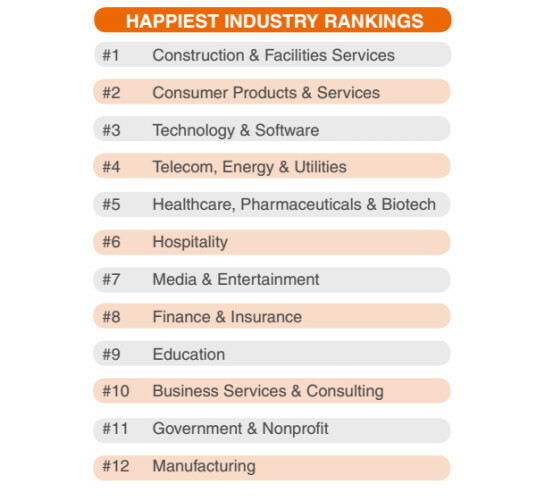 TINYpulse recently released the 2015 Best Industry Ranking Report, which surveyed more than 30,000 employees from 500 different companies on their job satisfaction. They found that the Construction & Facilities Services is the happiest industry. This is followed by Consumer Products & Services, Technology & Software, Telecom, Energy & Utilities, and Healthcare, Pharmaceuticals & Biotech. A further look into TINYpulse's research reveals what leads to employees being happy at work. The number one answer (34%) was "I work with great people." Others also said "I'm excited about my work and projects" (19%), and "I enjoy a positive work environment" (10%). According to this research, the two biggest factors of a happy workforce includes being satisfied with colleagues and being satisfied with individual projects. "These findings are remarkable because they show me that any leader -- no matter the industry that they’re in -- has the power to make workplace changes to materially impact job satisfaction," said David Niu, founder and CEO of TINYpulse." When it comes to building a happy work environment, start during the hiring process and focus on candidates that would be a good cultural fit. Ask about their process for collaborating in group projects, their personal approach to dealing with workplace pressures, and how they manage their accountability and responsibility. TINYpulse also investigated what is making those in the manufacturing industry so unhappy and learned that having an unsupportive manager is the number one driver. A simple way of starting to understand how employees are feeling about their work is by giving them an opportunity to have their voices heard. Regular anonymous surveys can help management better gauge why employee happiness and engagement is so low. Get workers to answer on a scale of 1 to 10 and ask questions like, "How would you rate the performance of your direct supervisor"" and "How happy are you at work?" Are you part of a happy or unhappy industry? Do these results reflect your own feelings about your job?